Today we celebrate in Poland the Independence Day. We commemorate the anniversary of the restoration of Poland’s sovereignty (beginning of the Second Polish Republic) in 1918. After 123 years of partition by the Russian Empire, the Kingdom of Prussia and the Habsburg Empire. That’s why we publish a post about Polish apples. We have a lot of apples in Poland but some of them are typical for our country. 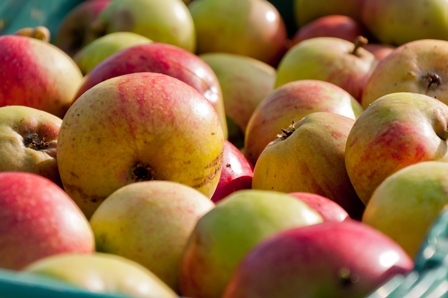 Delikates – typically Polish, autumn apples, grown for the first time in Poznan. They have a greenish-yellow skin with a clear red blush, their flavor is sweet and sour, and the flesh fine. Widely popular. Ligol – another variety bred in Poland. They appear in stores in winter and are characterized by yellow, shiny skin with a large, slightly red blush and creamy flesh. They are sweet, fragile, have a delicate, spicy aftertaste. Warning! They can not be stored long. Antonówka – old variety, often grown by amateurs. They are usually green, although the may become slightly yellowish color. They are hard, quite acidic and therefore well suited for preserves.